Reaching Your Community: Short-Term Mission Trip or Sold-Out Missionaries? In the last generation or two, the primary way that churches and ministry leaders in our (Western) culture have attempted to reach people who don’t yet know Jesus has been to build strategies around an “If you build it, they will come” approach. The church building was the hub, and we only had to wait for people who wanted to know about Jesus to come and find us. I’m not saying that such an approach was never effective. However, the approach reveals something about how Christians have tended to think about our place in American culture, and still do to some extent: to do ministry well, we have to get people to come to us. Here’s the question: Is that paradigm the way we’re supposed to reach people? This question is asked in just about any course taught on leadership. I remember a seminary class on leadership where we were asked that same question at the beginning of the semester. To be honest, I don’t really remember any of the definitions that were suggested. I’m sure most of our answers included words and phrases like influence, followers, and common vision. This passage usually is noted for the immediacy of Simon and Andrew’s decision to follow Jesus. Or it is highlighted in a sermon on evangelism, pointing out the Jesus’ primary call to discipleship was that of telling others about Jesus. Both applications hit the mark, but there is something else there that we usually don’t notice. You see, Jesus was calling Simon and Andrew to make an immediate decision. And he was calling them into a life in which — unbeknownst to them at the time — they would help change the entire world for millennia and on continents they didn’t know exists by spreading Jesus’ Gospel after his death and resurrection. But the heart of what Jesus was calling them to was this: something bigger than themselves. Here’s a word I’d like to strike from our Christianese dictionary: “Attractional.” The main reason is that for some, attractional is a dirty word. The more I hear arguments against what some call an “attractional” approach to ministry, the more puzzled I become. Let me fair: when many people use the word “attractional” in a negative sense, they are often criticizing an approach to ministry that downplays conviction of sin and the exclusivity of the Gospel (i.e. the fact that Jesus is the only way to be reconciled to God) so as to make new people more comfortable. I agree; that is not a biblical approach to ministry. At best, such an approach merely succeeds in filling seats, but not in changing lives. At worst, it convinces people who have yet to enter a relationship with Jesus that there is no need to humble ourselves to the God of the Universe and give their lives to Jesus. However, I’ve noticed that there are some who are concerned about any attempt to attract people–especially first-time guests who don’t yet know Jesus–to a church environment. I know I’m over-generalizing here, but it seems to me the primary concern of people worried about attractionalism in churches is this: If we try to get people to actually like church, it will eventually (and necessarily) result in proclaiming a message that is watered down, contrary to Scripture, and ultimately false. In short, if someone who doesn’t know Jesus likes to go to church, it must be because the message isn’t true. Whether or not you believe that statement dictates what you do on Sunday mornings and whether your church is a comfortable place for first-time guests to visit. If you do believe that statement, then you’ll do everything possible to roll out the red carpet for guests each and every weekend. Confession: I stole this one right from Andy Stanley (see his book Deep and Wide). It’s all to easy to assume that a first-time guest didn’t make a return visit to your church because they weren’t interested in Jesus. Maybe it was because you weren’t interested in the first-guest! You may think you’re the friendliest church around, but if guests aren’t welcomed, you don’t have signs to help a mom of a four-year-old quickly find the children’s are (or a bathroom), or you confuse guests with unnecessarily confusing language, you’re probably offending many of your first-time guests. When that’s the case, they may not be engaged or even stick around long enough to actually hear about Jesus. If that sentence makes you cringe because you assume that an enjoyable church service means a watered-down message, consider this: Jesus told jokes, shared captivating stories, and even loved a good party. Creating an experience on Sunday mornings (or whenever you gather for worship) that people who don’t yet know Jesus can actually engage with doesn’t mean you’re selling out. It just means that you actually care enough about people who are far from God to create an environment where they’re more likely to hear the unadulterated Gospel. In all too many churches, it’s very difficult for new people to crack the circle and be accepted as an Insider. The biggest issue with this is that it’s far easier for a Christian to figure out how to crack the circle than it is for someone who doesn’t yet know Jesus. Churches where Outsiders are made to feel like Insiders on their first visit will likely do a better job of helping people stick around long enough to be transformed by an encounter with Jesus. What Kind of Guests Are You Expecting? This month, our church is completing an overhaul of our assimilation system. We are evaluating and improving everything that first-time guests experience from the moment they drive their car onto our parking lot to the point when they call our church “home.” To be honest, I didn’t think it would be this hard–although the hardest part isn’t what you’d expect. The hardest part hasn’t been the large numbers of volunteers we need to recruit and train, asking for a substantial budget increase, or moving where the offering is in our service (gasp!) in order to give people a better chance to fill out their connection card. The hardest part has been learning to view a first-time visit to our church through the eyes of someone who doesn’t yet know Jesus and isn’t familiar with church. As we thought about how we’ve welcomed and tried to connect with first-time guests, it became clear that we’ve looked at our assimilation process only through our own eyes: the eyes of Christ-followers who have been around church awhile. The result was a process that was confusing and even intimidating to people who perhaps haven’t ever been a part of a church. We were expecting guests at our church, but our assimilation system communicated that the guests we were expecting were those who were familiar with church, rather than unchurched folks who might not have a relationship with Jesus. When our churches are confusing or hard-to-figure-out, we aren’t being good stewards of the first-time guests that God sends us. It doesn’t matter how friendly your church is (or how friendly you think you are); without a simple system for helping unchurched first-time guests get connected, most of the unchurched individuals and families who walk into your church probably won’t come back for a return visit. So, how can our churches be prepared for first-time guests who aren’t familiar with church? Lose the insider lingo. Church signs that have ministry names only church veterans could figure out communicate to unchurched guests that they are definitely not part of the in-crowd. In addition, anyone speaking from up-front in the auditorium–whether during the welcome, announcements, or the sermon–need to assume they are talking to people who aren’t familiar with their church, the service, or even the Bible. Branding and marketing is a difficult practice for many local churches, Christian non-profits, and even individual ministries to really grasp. Some churches have a logo that shows they haven’t thought about their brand for about 45 years. On the other side of the coin, some youth pastors are so concerned about their youth ministry’s logo and corresponding t-shirts that they really need to close their free trial of Adobe Creative Suite and step away from the MacBook Pro. But branding and marketing aren’t really about logos, websites, signage, or even advertising. Branding is communicating who you really are (or perhaps more accurately, who you’re striving to be). Due to the dishonest nature of much of the marketing in our culture, some leaders bristle at the thought of deliberately branding and marketing their church or ministry. In reality, every church markets in that they communicate to people (both those who are part of there church and those who are not) something about themselves. The trick is to do this in a way that communicates what your church is “about” (or again, what you are striving to be “about”). Since I’m no expert on branding and marketing, I’m grateful that Jesus actually addressed the issue of how leaders can successfully brand their local church (or youth ministry). Surprised? I figured you might be. But he did. That’s our brand. That’s how we are supposed to proclaim to our communities why we are here and what we are about. It’s how people are supposed to know that your church is a church. I’m not suggesting that you ditch your logo, your t-shirts, or your billboards and advertisements. That’s a part of our culture’s language, and so we’re wise to use that language well. But maybe we need to take more seriously the brand that Jesus gave us to use rather than trying to come up with something new that likely won’t wow people as much as we hope it will. After all, if we don’t love one another–and our communities–in a way that people will see at least a small glimpse of Jesus, then all the marketing in the world won’t help our local churches one bit. Really, really interesting conversation among John Piper, Matt Chandler, and David Platt on social justice and younger evangelical Christians. Definitely worth ten minutes of your time, especially since teenagers (to me, at least) seem geared towards projects and movements that involve social justice. Do you agree that social justice needs to be tied to personal evangelism? How can we help teenagers “be where they are” and serve, love, and share about Jesus where God has planted them? 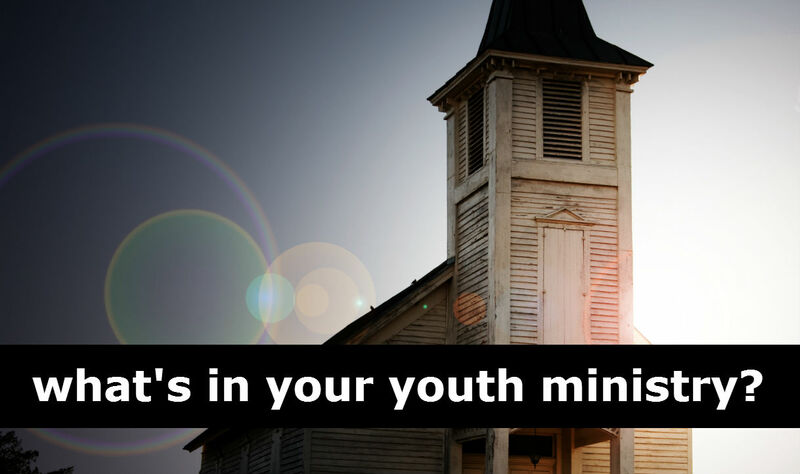 What role do you think social justice issues ought to play in youth ministry teaching and programming? Social Justice and Young Evangelicals: Encouragements and Concerns from The Gospel Coalition on Vimeo.